"You think that by Scripture you possess eternal life..."
By Rachel Held Evans, on February 21, 2012. “You diligently study the Scripture because you think that by them you possess eternal life. “It is Christ Himself, not the Bible, who is the true Word of God. In the second half of Chapter 5, Smith gets even more emphatic. As I said last week, this general guide for interpreting and applying the Bible makes sense to me.It’s not about discounting the historical/grammatical method in favor of forcing a Jesus message into every last page, but simply looking at Scripture through the lens of the gospel of Jesus Christ just as Christians should look at everything through the lens of the gospel of Jesus Christ. 1. But everything we know about Jesus, we know from the Bible, so doesn’t that mean the Bible is indeed the foundation of the Christian faith? 2. Aren’t you creating false dichotomy between the written Word and the Word Made Flesh? Is it really necessary for Christian Smith to make these distinctions. It seems kind of pointless. Let’s take these objections one at a time. "But everything we know about Jesus, we know from the Bible..."
Like Smith, I just don’t buy the idea that the Bible is the only way we know Christ. In fact, I would argue that the Bible alone is not enough to know Christ intimately, as a true follower. That requires the work of the Holy and the regular communion with Jesus that we experience through the bread and wine, through loving one another, and through caring for the least of these. 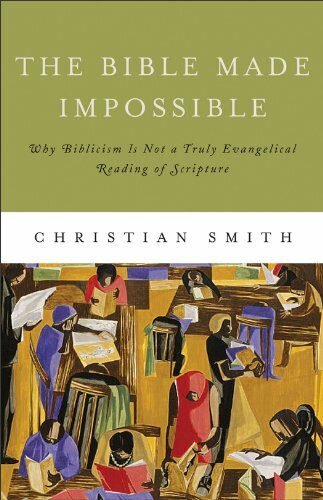 "This is a false dichotomy..."
Maybe it’s just because I’ve lived in the Bible Belt my whole life, but when Smith writes that, among evangelicals, Jesus often gets “sidelined by the interest in defending every proposition and account as inerrant, universally applicable, contemporarily applicable, and so on in ways that try to make the faith ‘relevant’ for everyday concerns,” I totally get it. Similarly, when it comes to biblical interpretation within evangelicalism, I’ve experienced a sort of “flattening-out” of Scripture in which the words of David carry the same weight as the words of Paul, which carry the same weight as the words of Christ. It is as though Jesus is just one more character in the story, rather than the whole point of the story. In fact, I’ve been in multiple conversations in which the apostle Paul seems to be hailed as the final authority on Christianity, his words, in effect, trumping the words of Jesus. So, while it may be problematic to make too much of the distinction between Scripture and Christ, I think that evangelicalism will benefit from a reminder that our faith centers around the living person of Jesus Christ—the World Made Flesh—not on the sacred texts that point to him. Smith wraps up the chapter by talking about Karl Barth, who apparently said all of this a while ago. He concludes with a final example of Biblicism that most of us encounter in childhood. Next week, we will discuss Smith’s final chapters before moving on to N.T Wright. Does Smith’s response to these common objections to his thesis satisfy you? Do you sense that some Christians elevate Scripture above Christ? Or is this much ado about nothing?